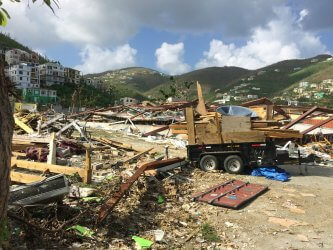 One of the first projects will be to rebuild a school funded by a wealthy local benefactor in Tortola, which is the largest of the British Virgin Islands. Mike said: “Although I saw the devastation on the television, nothing can compare you for the shock of seeing it before your own eyes. “People said that that they had experienced some incredible hurricanes but that this was on a completely different scale. “Many buildings were just a tangled mess. I was one of the first businessmen allowed in and it was good to see that our buildings had withstood the joint onslaught as well as they had. Mike added: “As a company we have built strong personal bonds and business links with the Caribbean over many years. Our buildings are designed and built to withstand the toughest environments on earth as well as natural disasters such as hurricanes, earthquakes and tsunamis. We have the capability to design, manufacture, ship and erect entire steel buildings including their cladding and or glazing requirements anywhere in the UK, Europe and the world.